In a 90-minute workshop, frog design made a case for why walling your company off from the rest of the industry can be detrimental. These are the words of Scott King, frog design‘s director of strategy, as he guided a group of 20-some-odd attendees through a workshop in New York on how to partner with others inside a competitive industry to expand a business. Part of the Fast Company Innovation Festival, the frog-hosted event grouped attendees into different sectors of the electric vehicle industry–the major tech sector, the oil and gas sector, the government sector, the retail sector, the battery sector, and the retail and automotive manufacturing sector–asked them to visualize the relationships between these different sectors, and then partnered groups up to devise a strategy for a mutually beneficial endeavor. Few rules were imposed on attendees for each exercise; King, along with frog Senior Interaction Designer Alexandra Coym, even encouraged them to break the rules if need be. But they were working against one crucial element: time. In each exercise, groups had only 30 minutes to accomplish the task at hand. “In this case, precision is not your friend,” King explained as he handed them an overwhelmingly large packet full of relevant industry information. As groups got to work mapping out the electric vehicle ecosystem, the interactions predictably started out as a bit awkward. But each group developed its own set of tactics for accomplishing the goal. In some cases, it was a democratic effort. In others, one person stepped up and took the lead. 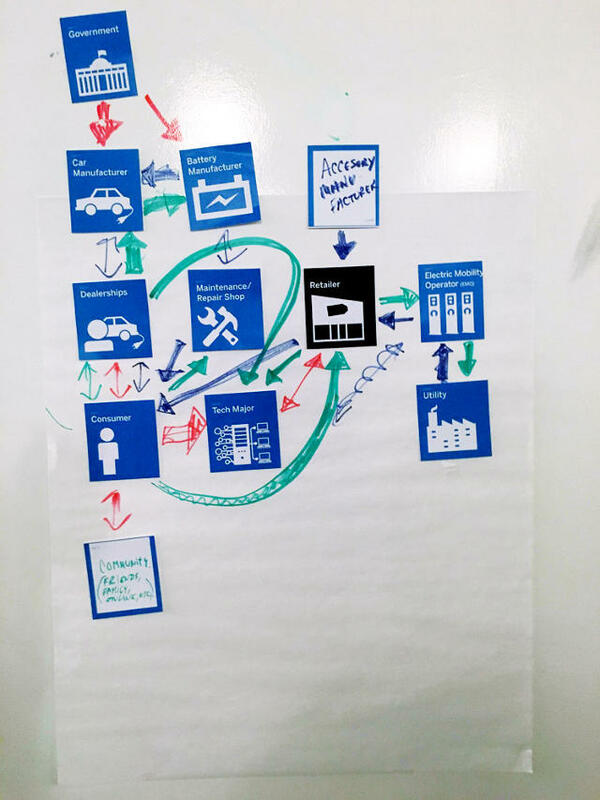 Every group had very different ways of visualizing the relationships in the industry, but ultimately, the conclusion was the same: the relationship between industry sectors is always byzantine, and opportunities are always plentiful. While the government might already oversee the energy sectors, and there’s an existing relationship between the tech and retail sectors, there is plenty of room for the government to incentivize an innovative tech company to create a product, or for the battery manufacturers to partner up directly with retail outlets. These are the channels King wanted attendees to explore, and as the collaboration began, ideas began to emerge. One meeting of the minds devised a system to monitor activity and consumption at any given gas station. At any given gas/charge station, the tech sector proposed tracking the volume of cars entering the station, the types of cars entering the station, the amount of gas bought, and then using that data to better prepare locations for the boom and bust of incoming drivers. In another collaboration, a system for repurposing old car batteries into power sources for government-approved green housing was devised. It may not have been a venture for the electric vehicle industry, but it was envisioned as a byproduct of electric cars’ rise. And ultimately, what people came away with was not a rigid set of steps to guarantee success, but a fluid system for thinking and problem solving. And at its core, that’s exactly what design is about.